Having tasked Auspicious to create an eclectic kitchen in their Ludlow home, these clients also desired something equally unique in their bedroom. 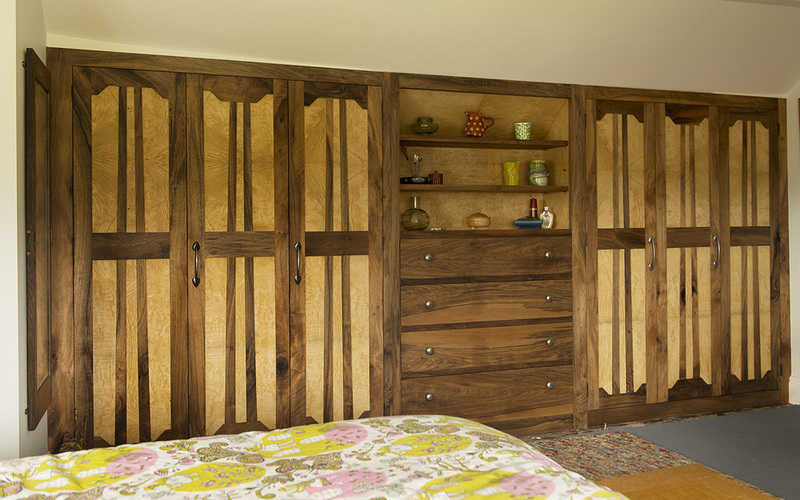 With complete creative freedom, we were able to design and build an arts and crafts style wardrobe . Despite being lovers of oak, this time the couple wanted something different. The wardrobe brings together ash burr and walnut, two bold yet sympathetic timbers. English walnut frames and drawers contrast with decorative ash burr panels, laced with intricacy and detail. To make the most of the space, the wardrobe was built into the eaves, giving its proud owners more than just a roomy his-and-hers wardrobe. It’s a piece of craftsmanship they take great pleasure in admiring.